We finally got the results about what type of bacteria she had in her urine, and the results were good - the iv antibiotics she had been taking works on that bug. So the doctors reduced the number of antibiotics she received to one. Her last dose (giving her 3 days worth), would be Friday night, and then she would switch to oral meds on Saturday. I was told that discharge may be possible Saturday, since they wanted to see how she would handle the oral meds. I tried not to get my hopes to high. Over the last week I've been sleeping in various places at the hospital so I can make it to Ruth's night feedings every 3 hours. Friday night they let me "room in" with Ruth, meaning she was freed from all her monitors and got to go with me to my "room" (which resembled more of a closet). It was wonderful, and the nurses left me alone with her so long as I posted a note listing her diaper changes and when she eats. Being able to hold her without dragging a line of monitor wires with me was so nice! 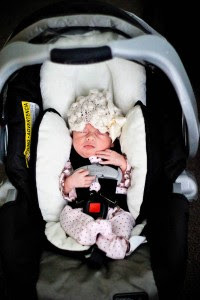 Saturday morning I took her back down to the Nicu bay, and was told she was ready! I ran into our wonderful resident and she said she was on the way to write the discharge orders. I was expecting late afternoon, and it was a bit of a shock! The wonderful nurses loaded me up with all sorts of supplies to last me the next 5 days before I go home, and I called up our friends from the Family House, since they offered to pick us up so we wouldn't have to take a taxi. I left in a such a hurry I felt like I didn't get to say goodbye to everyone! I've spent so much time there over the last month, it felt weird just to leave. 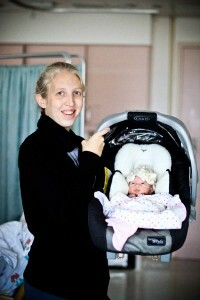 The care we received was wonderful, and I am so grateful for the doctors and nurses that took care of Ruth. Since Ruth still needs the urodynamics study (VCUG) to determine her bladder and kidney health, and also to determine whether we need to continue cathing her, we will stay in SF until that appointment on Tuesday afternoon. We will then get to fly HOME on Wednesday! I cannot wait to see all my girls, and have our family together again! I am so excited for you and Ruth!! We cannot wait to see you both! Have a safe trip home!! Happy Birthday! So glad that Ruth is discharged and you are homeward bound soon. I can't imagine how much you must be missing your other girls. I am wising you the best of luck with everything in the upcoming weeks. Safe travels home!! You guys will be in my thoughts.